Dr. Jones is a Professor of science education. Her teaching focuses on science teacher preparation and her research examines teaching and learning science. Dr. Jones' research focuses on learning science in a variety of sociocultural contexts. Her research examines how a number of subgroups learn, including: gender, minorities, and students with visual impairments. 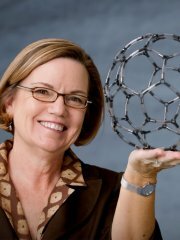 Recently Dr. Jones has conducted a series of studies that examine nanoscale science education. She directs the Nanoscale Science Education Research Group that is investigating how people learn scale and scaling, the role of haptics (touch) in learning, and effective strategies for learning nanoscale science. Dr. Jones also investigates virtual reality interfaces for learning science. Lee, T., & Jones, M. G. (2017). Elementary teacher’s selection and use of visual models. Journal of Science Education and Technology, 1059-1045. Childers, G., & Jones, M. G. (2017). Learning from a distance: high school students’ perceptions of virtual presence, motivation, and science identity during a remote microscopy investigation. International Journal of Science Education, 39(3), 257-273. Gardner, G., Jones, M. G., Albe, V., Blonder, R., Laherto, A., & Paechter, M. (2017). Factors Influencing Postsecondary STEM Students’ Views of the Public Communication of an Emergent Technology: a Cross-National Study from Five Universities. Research in Science Education, 47, 1011-1029. Delgado, C., Jones, G., You, H. S., & Halberda, J. (2017). Scale and evolutionarily-based approximate number system: An exploratory study. International Journal of Science Education, 39(8), 1008-1024. Jones, M. G., Corin, E., Andre, T., Childers, G., & Stevens, V. (2016). Factors contributing to lifelong science learning: Amateur astronomers and birders. Journal of Research in Science Teaching, 54(3), 412-433. Taylor, A., & Jones, M. G. (2011). Students’ and teachers’ application of surface area to volume relationships. Research in Science Education, 41(3), 357-368. Jones, M.G., Paechter, M., Gardner, G., Yen, I., Taylor, A., & Tretter, T. (in press). Teachers‘ concepts of spatial scale. An international comparison between Austrian, Taiwanese, and the United States., International Journal of Science Education. Rua, M., & Jones, M. G. (in press). Conceptions of Germs:Expert to Novice Understandings of Microbes.Electronic Journal of Science Education. Jones, M. G., Taylor, A., & Forrester, J. (2011). Developing a scientist: A retrospective look. International Journal of Science Education, 33(12), 1653-1673. Jones, M. G., & Taylor, A. (2009). Developing a sense of scale: Looking backward. Journal of Research in Science Teaching, 46(4), 460-475.